My most favorite Jon Brion song is Hook Line & Sinker. Not sure when I first heard that song, but iTunes says I added it to my library on 9-14-04. I do remember that Jeff introduced me to what would become my future love affair with the music of Jon Brion. And, he plays here in L.A. every week and I still haven't been to see him. At least I have the excuse of being seriously preoccupied with a major job search. I've transcribed this song, and for some reason it's not that easy for me to play. Maybe it's the X with X in the bass (x/x) tonal center head turner (think of a dog turning it's head to one side like he's thinking), or maybe it's been too long since I actually figured out the chords to anything. I had to change the key a few times to get it into my appropriate girl-key so I can't remember what key it's originally in. It's nearly 4 a.m. in Los Angeles, which means New Yorkers are already in the shower. If it wasn't so freakin' late/early, I would saunter over to the piano and figure it out again. I can say, though, that I wish I had written this song. And he seems to be a bit of a clothes horse , too, Huh? Hey you can come over here to jam on Garage Band at 4:00 in the morning if ya want. Think of it as a red eye kind of thing. 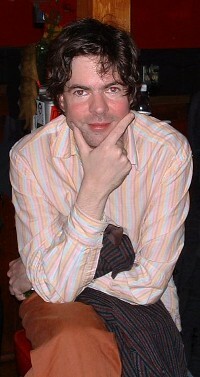 Jon Brion is cute. Okay okay, I know I haven't posted in like a month. My posts must be serious reflections on music yadayada. But he's cute! Okay. Doesn't he bear a slight resemblance to, oh, someone we know??? ?